See a note of January 22, 2016, added to the end of this post, for further information. 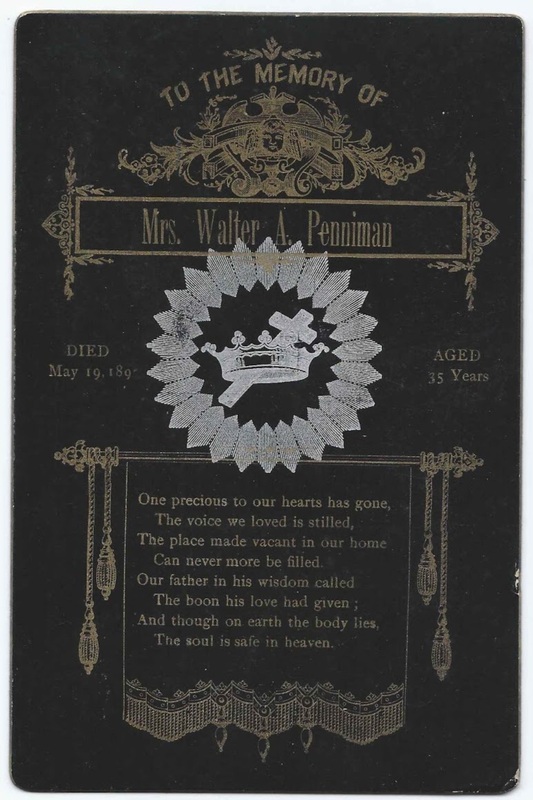 Two memorial cards, one for William R. Penniman of Braintree, Massachusetts, and the other for his daughter-in-law Mary Ethel (Hall) Penniman, wife of Walter Aldrich Penniman, of Brockton, Massachusetts. The reverse of William's memorial card has the imprint of the maker, Memorial Card Co. of No. 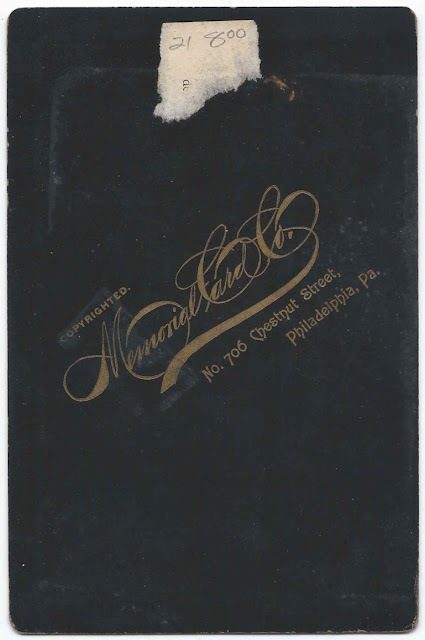 706 Chestnut Street, Philadelphia, Pennsylvania. 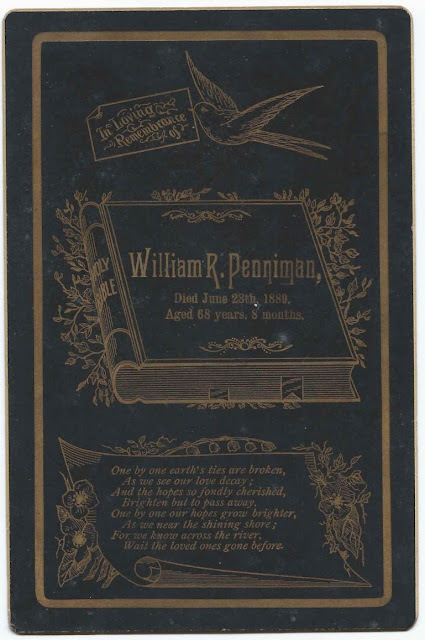 William Reed Penniman was born 19 October 1820 at Braintree, Massachusetts, son of Thomas Ora Penniman and Dorcas Elizabeth (Reed) Penniman. On 15 July 1849 at Braintree, Massachusetts, William married Louisa Maria Aldrich, daughter of Nathaniel and Anna (Paine) Aldrich. Louisa was born, I think, 18 August 1831 at Woonsocket, Rhode Island. On 12 November 1885 at Brockton, Massachusetts, son Walter Aldrich Penniman married Mary Ethel Hall, daughter of Augustus Florentine Hall and Susan Elizabeth (Osborne) Hall. Mary Ethel was born 1 December 1861 at East Bridgewater, Massachusetts. On Census forms, Walter's occupation is listed as carpenter, but he was perhaps a contractor like his father, perhaps in the family business. Walter and Mary Ethel had a daughter, Rita Mildred Penniman, "May", born 31 October 1890 at Brockton, Massachusetts. She would marry Herman Ralph Eaton at Worcester, Massachusetts, in 1912. Mary Ethel (Hall) Penniman died of cancer on 19 May 1897 at Brockton, Massachusetts. Walter Aldrich Penniman married for the second time, on 24 December 1899 at Brockton, Massachusetts, to Keziah H. (Murdock) Mank, daughter of Silas and Sarah Waterman (Perkins) Murdock and widow of Everett F. Mank. Note of January 22, 2016: Coincidentally, a carte de visite, purchased at a later time, depicting Isabella Calef, a teacher for a while at Brockton, Massachusetts, contains information on the reverse about her student M. Ethel Hall ("Grandma Ethel"); Rita Penniman and Keziah Murdock.